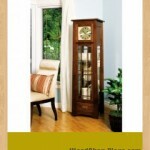 In keeping with traditional Arts and Crafts design, I built this clock cabinet from quartersawn white oak. 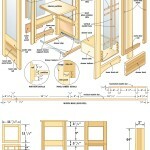 Begin construction with the framed panels that form the sides, front and back of the cabinet. Each frame consists of two long vertical stiles and a series of short, horizontal rails, all connected together with dowels. You could use traditional mortises and tenons to assemble the joints, but dowels are almost as strong and much quicker to prepare. The only tricky part here is making the tapered stiles for the sides of the front and rear frames. I started with rectangular blanks measuring 3″ wide x 64″ long, then I drew the taper with a long straightedge and a pencil. Next, take the pieces over to the bandsaw and cut the angle, keeping a consistent 1/16″ outside of the layout line. A quick trip to the jointer takes care of the rough edges left behind by the saw blade. Save the off-cuts for later. Next, mill a 3/4″-wide by 3/8″-deep dado the entire inside length of the front and rear stiles. This groove will receive the edges of the side frames later. For now, gather all the blanks for the lower frame rails and lay out the curved profile on their bottom edges. Cut out the curves on the bandsaw, then sand the edges smooth. Next, drill dowel holes to assemble the frames. Two 3/8″-diameter x 1 1/2″-long dowels and glue for each joint provide plenty of strength. Clamping the front and rear frames together during assembly is a challenge because the tapered edges on the opposing sides aren’t parallel. The solution is to use the off-cuts you set aside earlier as shims under the clamps’ jaws. In addition to preventing the wood from getting marred, the off-cuts square up the edges, creating a solid grip. If you find that the scrap shims slip when force is applied, use double-sided tape to anchor them temporarily. Make sure the frames are square before leaving the assemblies to dry overnight. guided rabbeting bit to recess the openings on the inside faces of the side frames and exterior faces of the rear frames. These rabbets should be 3/8″ deep to accommodate glass or wood inserts that will occupy the openings. The router bit will leave behind rounded corners. Square them by hand, using a sharp chisel and a mallet. Your next job is to drill 5-mm diameter holes for the shelf pins that will eventually support the adjustable glass shelves. It’s much easier to drill these holes prior to assembly, while you still have easy access to the interior faces of the frames. Wrap some tape around the bit to tell you how deep to go and make a drilling template to achieve consistent spacing. The solid-wood partition panels that divide the interior of the cabinet rest on wooden cleats attached to the sides and back. To achieve a perfect fit and flush alignment along the top edges, it’s best to cut and install these thin cleats with the side frames temporarily assembled without glue. Air-driven brad nails are the easiest option for tacking the parts in place while the glue dries. You could also use small screws or finishing nails. For fine finishing work such as this, I use 23-gauge brad nails because the thin diameter and head-free design leaves an entry point that’s almost invisible. The next step is to glue-up wide panels for the interior partitions and the top. The grain direction on these panels runs from side to side so that no end-grain is visible from the front of the cabinet. Make the panels oversize to start, then trim the edges to the final dimensions after the glue has dried. A few biscuits will help with alignment during assembly, but when you prepare the top panel, be careful to keep the slots well clear of the ends so the biscuits aren’t revealed when the panel is cut to length. Take a look at the plans to see how the corners of the interior partitions are notched around the vertical stiles at the front. Mark the notch locations, then make the cuts with a jigsaw or bandsaw. Remove saw marks with a sanding block and you’re ready to complete another dry fit: this time, with the interior partitions in place. If everything looks good, reassemble the cabinet for the final time with glue applied to the frame joints and the top of the panel support cleats. Next, prepare solid-wood panel inserts to cover the small openings on the sides of the cabinet, at both the top and bottom. For these parts, you want to orient the grain direction vertically. Cut panels 3/4″ taller and wider than the recessed openings on the interior of the frames, then use the same rabbeting bit on the edges. This forms a flange that secures the inserts to the cabinet. Try the panels in the openings to make sure there is a little wiggle room to allow for seasonal expansion and contraction. If the fit is too snug, trim a little material from the edges and re-rout the rabbets. When you’re satisfied, install the inserts with glue applied only to the middle 2″ section of the top and bottom flanges. The remaining edges are left dry to allow the wood to move. Clamp the inserts in place while the glue dries or tack them with your trusty air nailer if you have one. Next, you need to construct the face board that will receive the clock dial. To provide some contrast, I made it from 1/4″ birch plywood, finished naturally with a couple of coats of clear polyurethane. 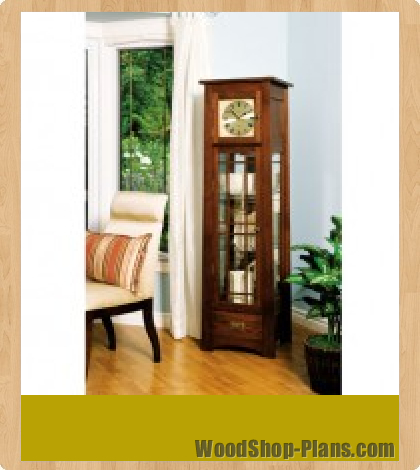 You’ll need to cut an opening in the panel with a jigsaw to accommodate the clock mechanism. Don’t worry if the cutout is a little ragged because it’ll be hidden from view after the clock dial is installed. The clockwork I used came as a kit that included a battery-powered movement, a Roman brass dial and a complete set of hands. I installed the dial on the face board with double-sided tape. The movement mounts directly to the dial, using the nuts and washers provided. The face board is secured to side cleats attached to the interior walls and bottom of the upper cabinet compartment. They should be located 5/8″ from the interior of the front frames. Glue the cleats in place but don’t permanently mount the face board until after the cabinet has been stained. It’s almost time to order glass, but first make the two doors—a small one that covers the clock face, and a larger door for the main part of the cabinet. Both require a pair of rails and stiles connected with dowels in the corners. After the door frames are assembled, rabbet the openings on the back to receive glass, using the same router and chisel technique as before. Next, set the small door aside and concentrate on making the decorative grid assembly (the strips used are called muntin bars). These narrow wooden strips are notched to form half-lap joints where they intersect, with material removed from the ends to create tabs that mount the muntin bars to the surrounding door frame. This may sound complicated, but it’s not. Start by ripping long strips of wood from 3/8″-thick oak to make the muntins. Prepare a few extras just in case you make a mistake later. After checking the measurements of your door opening, cut two vertical and four horizontal strips to fit snugly between the frame sides. Now, adjust your saw blade height to cut precisely halfway through the thickness of the material. Make test cuts on scrap to ensure you have it just right. If you use a dado blade, you can cut the notches in a single pass; otherwise, you’ll need to make repeated runs to clear all the waste material. Mark the location of the notches and end tabs, then make your cuts with a backer board behind the parts to minimize tearout. If you group the parts together, you can save time by cutting several notches at once. As an added advantage, this technique results in openings that are perfectly aligned. With this work done, snap the grid together with glue applied to the joints and set the assembly in the door opening to mark where the tabs rest on the rabbeted edge of the frame. Using these reference marks as your guide, mill 3/16″-deep pockets in the rabbets of the door edges to accommodate the muntins’ tabs. I did this by setting the depth stop on my drillpress to bore a shallow 3/16″-deep hole using a 1/2″-diameter Forstner bit. Drilling removes the majority of the material, so you simply need to square the corners with a chisel. Your goal is to create pockets that match the exact thickness of the tabs so that the surface of the rabbet and the back of the muntin assembly end up being flush. When you’re satisfied with the fit, glue the muntin into the door. I mounted the doors on the cabinet using full-wrap minaret hinges with an antique brass finish. Temporarily install the doors so you can make adjustments before staining the cabinet. If you find there’s insufficient clearance around the edges, trim equal amounts from opposing sides to make the doors fit. I used spring catches to keep the doors securely closed. For the long curio door, catches are required at both the top and bottom, but only one is necessary for the smaller door at the top. Measure the openings for your glass order. You’ll need 1/8″-thick glass for the cabinet sides and doors, 1/4″-thick clear glass for the shelves and a 1/8″-thick mirror for the back. To avoid any mistakes, make full-size patterns from 1/8″ hardboard and hand them to your glass supplier to use as templates. 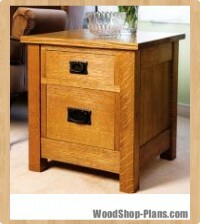 The glass for the doors and cabinet sides are best held in place with wooden retainer strips. You can cut the strips to size and dry-fit them in the openings, but don’t install them permanently until after the finish is applied. I stained my cabinet using Michel Roy’s favourite Mission recipe. Like most finishing techniques, Michel’s approach begins with a complete sanding of the entire project through to 220-grit paper. Next, apply a fumed light oak aniline dye mixed with a touch of dark red. Experiment on scrap to get the colour just right. Next, apply a generous coat of Old Masters wiping stain in dark walnut. Wipe off the excess with a clean cloth after letting the stain absorb for a few minutes. Let the stain dry for a full week before applying three coats of wipe-on satin polyurethane to protect the surface. When you finish the drawer front, mask the sides with tape to avoid transferring dye and stain to these parts. Also, try to keep the stain out of the frame rabbets, but don’t forget to finish the back of the grid assembly on the curio door and the retainer strips for the glass. When the finish is complete, apply a light bead of clear silicone caulking to the rabbets and place the glass in the openings. Next, spread silicone on the backs of the retainer cleats and clamp or tack them in place with a pin nailer. Let the silicone set overnight before remounting the doors on the cabinet. Drill holes to install knobs for the cabinet doors and a handle for the drawer. I selected hardware with an antique brass finish. Glue the mirror to a 1/4″-thick plywood backer board using silicone caulking prior to installation, then secure the assembly with four screw-on retainer clips. Mount the clock mechanism on the face board and drop it into place from the top of the cabinet. Tack this board to the retainer cleats you attached earlier. Cut out a panel for the back of the clock compartment from 1/4″-thick plywood and secure it with more of those retainer clips. The clips make it easy to remove the panel when it’s time to change the batteries. Make a plywood panel to cover the opening located behind the drawer, installed permanently with glue. I mounted a brass key light inside the cabinet to highlight knick-knacks on display. This light screws to the underside of the top partition. Drill a hole in the panel to allow the cord to pass through into the clock compartment, then notch the rear plywood panel at the bottom to allow the wiring to exit the back. 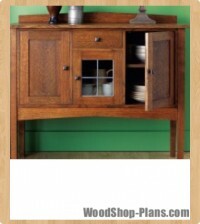 Finish up by attaching the cabinet top using four L-shaped metal brackets installed with screws from inside. Now that you’re an expert at building Arts and Crafts furniture, there’s nothing stopping you from designing a few companion pieces to keep the movement alive and thriving for another hundred years. If you want your drawer to have a precise fit, don’t rely on the dimensions given in the materials list—measure the opening for yourself and adjust the plans as required. When you take your measurements, allow for 1/16″ clearance on all sides. To economize, I made the sides and back of my drawer out of poplar and I used a commercial dovetail jig. The back corners are connected with rabbets. Prepare these joints, then cut 1/4″-deep grooves to receive the plywood drawer bottom. After cutting the bottom to size, assemble the drawer with glue applied to the joints. The drawer slides on L-shaped aluminum runners that are screwed to wood cleats at the front and rear. When you install the cleats, position them 1/16″ below the top edge of the lower frame rails to allow for half the thickness of the 1/8″ aluminum runner material. This leaves the drawer sitting with a uniform 1/16″ of clearance on all sides. Cut the aluminum runners to length using a hacksaw, then file to remove burrs. Cut the drawer stop to size, drill pilot holes in the aluminum and secure the piece with a pair of screws installed from underneath. 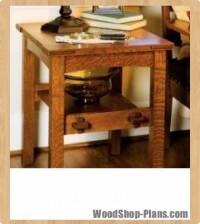 Save your knees by laying the cabinet face down on the workbench to complete this last step. 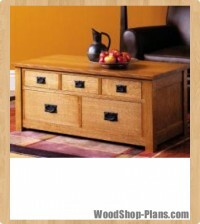 Quartersawn white oak will forever be known as the classic lumber of Arts and Crafts projects. The almost vertical end-grain of quartersawn lumber makes it extremely stable and results in a consistent grain pattern that’s pleasing to the eye. Quartersawn lumber is more expensive than flat-sawn boards because the milling method results in less lumber from a given log, although the beautiful grain is worth the extra cost. Before making a purchase, examine each board carefully for signs of checking on the ends and cracks on the face (known as honeycombs). These can occur when the lumber is dried too quickly. You should also carefully select boards with a consistent colour and prominent grain pattern.